Prior to the season, we posted our 2018 college football preseason rankings. Now that we’re midway through the conference season and with the first release of the College Football Playoff rankings this past week, it’s a good time to revisit those preseason rankings. In this post, we’ll look at the teams that have most exceeded and underperformed relative to our preseason predictive ratings. We’ll also look at our top teams relative to the current College Football Playoff rankings, and check in on the teams where our preseason rankings differed the most from the AP Poll. Want to get all our college football predictions? Check out our premium football packages. It’s also almost college bowl season, and our picks for college bowl pick’em contests are now on sale. First, when we refer to the TR Rankings, we are referring to rankings based on our college football predictive ratings, which are our core measure of team strength. Those ratings are designed, as the name implies, to predict future outcomes of games. Like many “smarter” power ratings systems, our predictive ratings are driven by margins of victory, as opposed to win-loss records or the opinions of coaches or journalists. Humans are often biased, and a team’s win-loss record in a (very short) college football season can be highly influenced by luck (e.g. if a fluke fumble happens in the 4th quarter of a critical close game, vs. during a blowout win when it doesn’t end up making an ounce of difference). Because of the potential influence of luck over a small number of games, a team’s preseason rating also continues to impact its predictive rating during the season. However, the weight given to preseason rating (which you can find in our 2018 preseason college football rankings post) decreases as the season goes on. Whether you agree or disagree philosophically with this approach to ranking teams is your prerogative, but the bottom line is, we’ve tested our approach extensively over many years of data and it works very well. For instance, as of Friday, November 2, our college football predictions ranked No. 4 overall (out of 63 measured systems) on ThePredictionTracker.com, with a 74.8% accuracy at predicting game winners so far this season. Through October, that’s even better than Vegas betting lines have done. Cincinnati leads the way after their remarkable 7-1 start. The team has only been Vegas underdogs three times, winning two of them, as second-year head coach Luke Fickell completes a successful turnaround after the program went 4-8 in back-to-back seasons. Fresno State’s two-year improvement is even more impressive under head coach Jeff Tedford, considering the Bulldogs finished 1-11 in 2016. Tedford led the team to a 10-4 record last year, and they’ve started 7-1 this year with all seven wins by at least 18 points. Can the best get better? Apparently. Alabama started the season as our top-ranked team but has still exceeded our expectations in a big way, with a 9.7-point rating improvement. 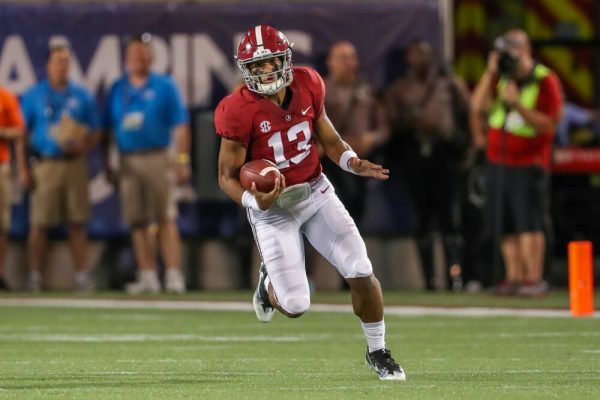 The Crimson Tide’s closest game to date was a 45-23 win over Texas A&M. They face their toughest test this week at LSU. Our ratings don’t like Kentucky quite as much as the College Football Playoff committee, but the Wildcats have still been a pleasant surprise. They stayed in the CFP hunt last week with a last-play win at Missouri. The loss of former Heisman Trophy winner Lamar Jackson apparently meant more than we expected for Louisville. The team had high hopes before getting shelled by Alabama 51-14 in Week 1, and they haven’t won a game since September 15. Another former top ACC team, Florida State, has been similarly disappointing. New head coach Willie Taggart has struggled to find consistency with a 4-4 record, and the Seminoles took it on the chin in a 59-10 home loss to Clemson last week. Wisconsin is a perennial Big Ten competitor, but that’s probably not the case this year. They’ve fallen from #4 in the preseason to #25 in our current rankings after their 5-3 start. Is the Bill Snyder era finally drawing to a close in Manhattan? Kansas State is just 1-4 in the Big 12 and 3-5 overall, and we currently give the Wildcats just a 9% chance to finish bowl-eligible. The last time the school failed to appear in a bowl was 2009. With the first CFP rankings now released by the committee, we can also compare how our team rankings as of November 1, 2018 stack up to the College Football Playoff committee’s rankings. It’s worth noting, however, that there is an “apples vs. oranges” angle to the comparison here. Our predictive ratings are solely measuring how we think teams will perform in the future, based largely on their schedule-adjusted margins of victory so far. The CFP rankings, on the other hand, do not have the same goal. The committee’s methodology, if you can call it that, almost certainly gives substantial credit for a good win-loss record, as well as other factors like “quality” wins against current or former top-25 ranked teams, in its quest to determine which teams are most worthy to make the Final Four. Consequently, a pair of 3-loss teams like Washington and Miami can still rank in the teens in our predictive ratings, thanks partly to being victimized by some close losses to good teams. However, neither of those teams is featured in the first edition of this year’s CFP Top 25. On the flip side, a team like 7-1 Washington State makes the top 10 in the CFP rankings, but our ratings aren’t as impressed by the Cougars’ win margins and opponent strength. Now let’s take a quick look at teams for which our preseason rankings differed the most from the preseason AP poll, and see how things have shaken out so far. Again, this isn’t an apples-to-apples comparison, as the AP Poll isn’t designed explicitly to predict future performance, and factors like a team’s win-loss record definitely impact the AP Rankings to some degree, since a lot of human pollsters give them weight. Some of the teams above have dropped in TR Ranking since the preseason, but six out of these seven teams (all but Mississippi State) are currently ranked higher in the AP Poll than they were in the preseason AP Poll. That’s a pretty solid data point regarding our ability to identify teams that the AP Poll had likely underrated. Here we see nearly the reverse. Five of the seven teams above didn’t receive any votes in the latest AP Poll, which again seems like a pretty solid directional data point regarding our ability to identify teams the AP Poll had likely overrated. Of course, we appear to have overrated several of those teams too, and West Virginia looks like our biggest miss of that list so far. But it’s worth noting the TR Rankings and AP Rankings disagree even more strongly now on a few teams — particularly Miami (now #15 TR, unranked AP). Again, if you’d like to get all of our college football predictions for the rest of the season, whether for betting purposes or for your weekly office pool, check out our premium football packages. It’s also almost college bowl season, and our picks for college bowl pick’em contests are now on sale.